These padded stack chairs from Offices To Go are an ideal space saving seating solution for any reception or waiting room. 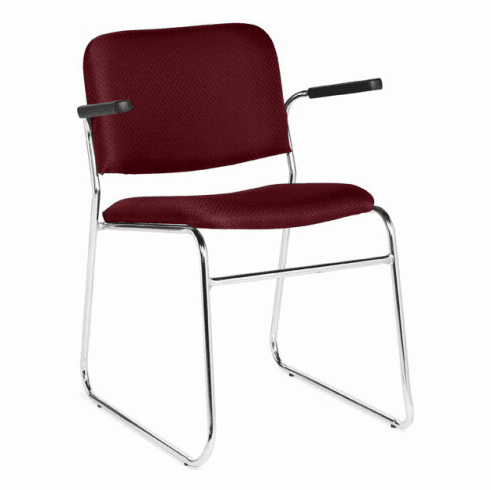 Features include durable stain resistant fabric upholstery, foam padded seat and backrest, black molded armrests and a tubular steel frame with brilliant chrome frame finish. Stackable up to 10 chairs high. This chair meets or exceeds ANSI/BIFMA standards. Dimensions: Seat Size: 16.5"W x 16.5"D. Back Size: 18"W x 13.5"H. Seat Height: 18"H. Overall: 30"H x 22.5"W x 23.5"D. Five year limited warranty from Offices to Go. Black or Gray fabrics normally ship in 1-2 business days. Wine and Navy fabrics normally ship in (15) business days.